Arm & Hammer Coupon is a printed coupon available at SmartSource.ca. Visit SmartSource.ca, select the Arm & Hammer coupon and click on ‘Print Now’. Bring you printed coupon into any major retailer and claim your savings. 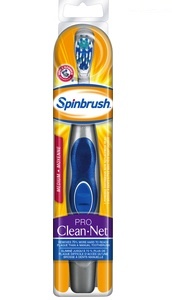 This is an Arm & Hammer coupon to save $1.50 on any Arm & Hammer® Spinbrush®. ARM & HAMMER™ Spinbrush™ Swirl features a spinning head, power angle tip and multi-level bristles that gently massage your gums while brushing hard to reach areas. And its easy to grip and control handle design helps make brushing more comfortable. Available in four designer colours, all with Soft bristles. For an even cleaner, whiter smile, use with a multi-protection toothpaste like ARM & HAMMER™ Advance Clean Complete Care Enamel Strengthening Gel.